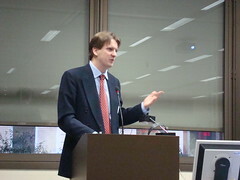 Robert Meins, Remittances Specialist from the Inter-American Development Bank, explained the importance of remittances from a financial perspective. In doing so, he also referred to the possible consequences of the current financial crisis on remittance flows. In some countries, remittances constitute a major part of the national GDP. In 2007, the share of remittances was 43% of GDP in Guyana, 35% of GDP in Haiti, 25% in Honduras, to give some examples. In terms of population receiving remittances, the Dominican Republic leads the statistics with 38% of the population, followed by Haiti with 31% and Guatemala with 22%. More than 60%, and in some countries even 80%, of remittances are spent on daily necessities, which is sometimes incorrectly labeled an “unproductive use”, as Mr. Meins explained. However, they are perhaps the “most successful poverty reduction programme”, because people use it to satisfy basic needs concerning food, clothing or shelter. The remaining 20–40% are mostly invested in human capital, such as health-care or education. Migration climate: By migrant work, immigration and employment laws have a major potential influence on remittances. Exchange rates: Appreciation or depreciation of the Dollar or the Euro increases or decreases remittances in local currency terms. The financial crisis poses short-term downside risks to remittances. To cope with deteriorating circumstances, migrant workers have proven to be very flexible. In times of economic downturn or inflation, they change jobs, work longer hours, have multiple jobs or consume less for themselves in order to send more money home. Concerning exchange rates, migrants tend to go to countries with strong currencies. If the immigration climate is worsening, migrant workers often move states. Returning home is only the very last resort. This leads Mr. Meins to the claim that remittances are very different from ODI or FDI, because they are not tied to profit, but are a family obligation. “Long-term migration and remittances will not fall due to the financial crisis”, he concluded.